Do you want straighter teeth? Correct spacing, gaps, bite and more with the many orthodontic treatment options at your orthodontic office in Dublin. Your Dublin, CA, orthodontist, specializing in braces, the Damon system and Invisalign, helps patients understand all of their orthodontic options. Learn more about the types of braces available from your orthodontist in Dublin, CA. Metal Braces. Traditional metal braces deliver consistent and gentle force to move teeth. Stainless steel brackets are affixed to teeth. Metal alloy wires are threaded through the brackets. Metal bands may encircle some back teeth. Tiny rubber bands hold wires to the brackets. 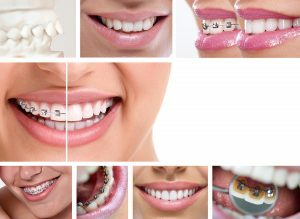 Metal braces are an affordable option at your orthodontic office in Dublin. Ceramic Braces. There are both traditional ceramic braces and self-litigating ceramic braces. The brackets consist of ceramic or porcelain and are tooth-colored. Brackets are affixed to teeth and wires are held to brackets with tiny rubber bands. Metal allot metal wires deliver gentle and consistent force to effectively move teeth. The coloring of the braces help them to blend in with the natural color of the patient’s teeth. Straighten your teeth effectively with ceramic braces from your Dublin orthodontist. Damon Braces. Damon clear is an element of the Damon System. The Damon System uses high technology and tieless brackets. The Damon System has been proven to move teeth remarkably fast helping patients get the smile and facial results desired. Their use of a “passive” slide mechanism enables teeth to move quickly and comfortably and reduces friction and binding. See if you are a candidate for Damon Braces at your orthodontic office in Dublin, CA. Invisalign. Invisalign is considered the “Most Advanced Clear Aligner System in the World.” Invisalign is a suitable treatment option for patients with an overbite, an underbite, crossbite, crowding, and spacing issues. The device can be removed at any time and allows patients to eat whatever foods they like. Patients can brush and floss normally. The device is made of smooth plastic that reduces the likelihood of cheek and gum irritation. Patients can straighten their teeth with little notice from any casual observer. Teens and adults enjoy the convenience of Invisalign. Speak with an associate at our office to learn more about Invisalign today. The choice is yours. There are a number of factors to consider when selecting the best type of braces for your needs and budget. Get the results you want using proven orthodontic braces from a respected Dublin, CA, orthodontist. Dr. Dante Gonzales in Dublin, CA, can go over each option in more detail. Call 925.828.2244 to schedule an appointment at Dante Gonzales Orthodontics, your orthodontics office in Dublin, CA, and review your options.